The prerequisite for the control and treatment of coccidiosis in poultry is to correctly identify the presence of disease. Two of the most widely used methods for this purpose are the identification and enumeration of oocysts, and the identification of lesions in the intestine. Although egg identification and counting was described for decades, and has been used since then, it is important to consider some key aspects of the method to obtain valid results. Have skills to identify the Eimeria species is the main element to be considered for the success of the morphometric study of field samples. For this, it is convenient to train yourself using pure parasite suspensions obtained in the laboratory. Although field samples differ greatly from these suspensions (Figure 1), particularly as regards the debris and impurities contained, if they are well preserved (refrigeration at 4-8ºC) the typical morphology of each Eimeria species is easily recognizable.Once familiar with the microscopic appearance, experience after analyzing many samples is what allows you to refine the method, always with an error range due to the “atypical” forms that can be found in all field samples. Counting and identification of oocysts, like any other diagnostic method, requires samples to be preserved in good condition. There is, however, a trend to believe that Eimeria oocysts are “indestructible”. Whilst these parasitic forms are among the most resistant known, their shape can be altered if the oocyst ages or matures (sporulates) over time, particularly when the temperature and humidity are favorable. To avoid this disadvantage, it is very important that the samples are fresh (preferably <7 days after being collected) and remain stored under refrigeration until they are analyzed.Thus maturation is prevented and the number of atypical forms is reduced. 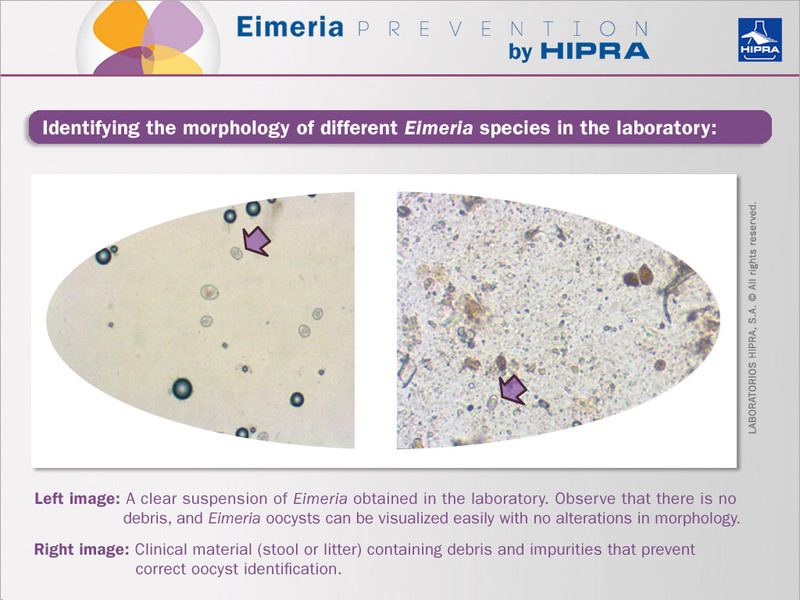 Not all laboratories perform the identification and counting of Eimeria oocysts in exactly the same way. However, there are some requirements that must always be met, if valid, repeatable and accurate results are expected. The validity is mainly linked to the prevention of cross-contamination among samples. The possibility of getting false positive results by cross-contamination in the laboratory is very high, particularly in places with a high workload. Thus, practices such as using disposable and sterile materials, changing gloves between critical steps in the procedure, etc., are crucial. On the other hand, the robustness and accuracy depend very much on the use of calibrated instruments and validated methods. Some key points are the correct homogenization of the sample before processing, weighing accuracy, the use of the correct dilution factor, and a microscopic observation method without artifacts. Finally, before making decisions about the treatment of coccidiosis based on the laboratory results, it is important to consider that Eimeria is prevalent and is found in the faeces and intestines of poultry. Therefore the significance of this finding must be weighed against other indicators of disease, such as the presence of clinical signs in live animals, as well as macro lesions and microscopic lesions in the intestine.